2 months ago I knit a beautiful shawlette (as you may know I am not normally a fan of those miniature versions of the great shawls), there is a mystery project in the Knitterai sock club again and I loved the last project so I decided to plunge ahead. The pattern called for green yarn, and after trying a variegated yarn, I opted instead for using one of the 2 skeins of Wollmeise that I snagged on Ravelry. I want to really see what all the hype is about this yarn, and if it is mainly a scarcity issue, or really worth something. 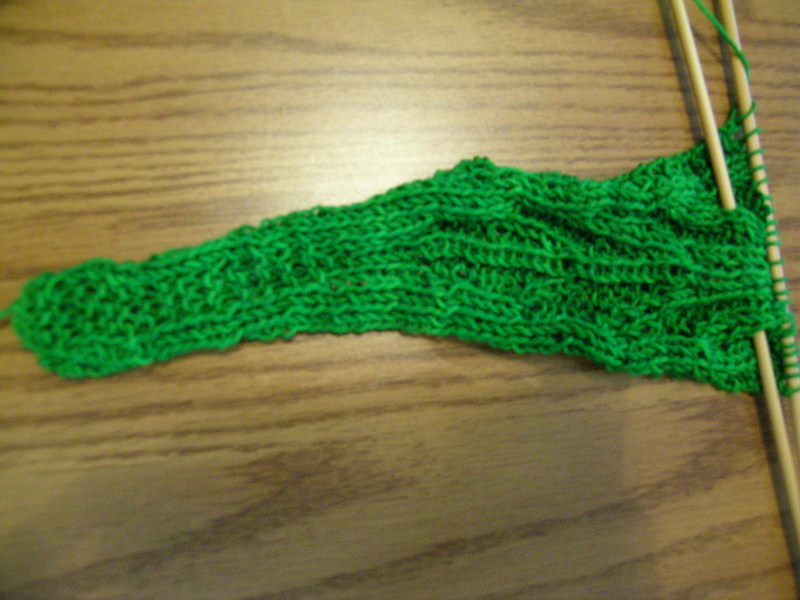 I am saving the green club yarn for the socks which I have also started, but not a lot to show at this time. Been starring at your picture for a few minutes and VERY curious myself as to what the heck that “thingie” is going to be! I love the color of the yarn, but green is my fave color. I bet its a dickie. You know a piece of neckware that is supposed to simulate an undershirt, so that one only has to wear the dickie and an overshirt. ← Wool, lots of it!